If you’ve heard stories about Stuttgart, Arkansas and the Mallard hunts of long ago, then you will be able to relate to what I found near Carrollton, Missouri this year! More ducks than you shake your CZ Shotgun at! Whether you’re training a young retriever or watching the trained professional dogs work, it’s a True Treat. Go to their Web Site for more information on life in the COMFORT ZONE! Buck Gardner, The Mojo Boys, and me, Tom Knapp with Birdhunting America all found out and ya can’t keep us away! 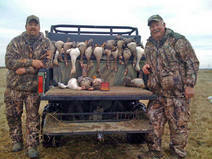 Contact Ben Gibson at By-Pass Farms to book your next duck hunt. Another "Favorite Hunting Spot" of mine is Mike Moore's "Valley Guide Service! Just got back from another memorable hunt. Limits of Speck's (White Fronted) geese. 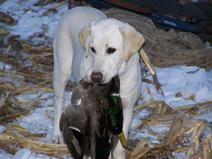 Mix in a few Snow geese and you have a Super Hunt!!! By far, one of the most enjoyable hunts you'll ever experience. If you like to fish, Mike can put you on the finest California fishing spots too. Check out his Web site and when you contact him, tell him I sent ya! 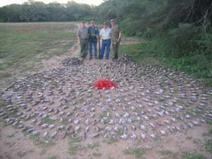 Argentina, a vast Country with incredible agricultural capabilities, holds the world’s largest population of eared doves. 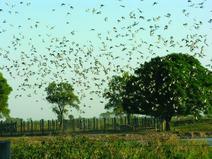 Cordoba Province, a true agricultural Mecca, holds over 50 Million doves alone. At El Cortijo lodge, the doves are so prolific, they are considered a pest, and it has been shown that they eat approximately 20% of the grain crops in the Cordoba area. Because of the temperate climate, doves nest four times a year and the survival rate is high for each nesting. 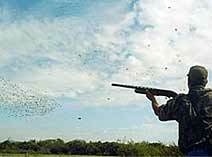 The hunting season for doves is year round, and hunters can expect to shoot 1,000 or more shells a day, if they choose to do so. This is the only place on earth where a true shotgun shooter can hone his skills in a live bird environment while actually benefiting the farmer and the country’s economy – truly, A WING SHOOTER’S PARADISE. If you would like 5 star lodging, 5 star service, and 5 star shooting at a very affordable price, simply click the website below. Mazatlan, Mexico offers action packed hunting with liberal limits of ducks and doves without having to circle the Globe to get there. There are different packages that offer very economical hunts that will satisfy any wingshooter's dreams of an out-of-Country hunting experience. If your spouse has difficulty accepting your ploy for Mexican Play, then offer to take them along. Mazatlan Wingshooting Club puts you up at the Holiday Inn Sun Spree Resort (5 Star Newly Remodeled Hotel Complex with a large swimming pool and off-set pool bars) right in the middle of Mazatlan's Golden Zone! There are other resorts to visit, shopping, restaurants, authentic open-air Taco Cafe's and even a Beach Within Reach, That Won't Shatter The Clatter of your Piggy Bank. In the evening there are a multitude of night clubs and dance halls where you can take in the true Mexican culture or perhaps hire a Mariachi Band to entertain during your meal. There is no end to the things-to-do in Mazatlan, Mexico! 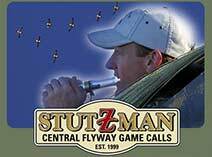 Prepare yourself for some of the most exciting waterfowl shooting ever when Tommy starts his calling routines! Even the most weary geese will fall prey to Tommy's realistic calls! Calling the Canada Goose is Tommy's specialty, but he'll put the ducks on the bill of your hat as well! I have hunted many preserves over the years and all I can say is if you ever wanted to hunt the rolling hills of NE Missouri, Cedar Hills is where I'd start! Their birds are released early and act like wild birds. Doug's "Covey System" allows hunters the excitement of a wild covey flush. If you have dreamed of a Midwest bird hunt in the classic tradition, you should contact Cedar Hill to arrange a customized trip designed to your budget and the needs of your group. Welcome to the Doland Hunting Lodge (DHL) in Doland, South Dakota just 45 minutes West of Watertown, SD on US Hwy 212. We believe that a hunter doesn't have to suffer to have a real hunting experience. We have recently remodeled our entire lodge to provide modern touches, so you can concentrate on the thrill of the hunt no matter what the weather or conditions. All new appliances, Laundry Room, Indoor Dog Kennel Area, and much more. We provide a place with amenities so that you can easily have clean, dry clothes and a hot meal no matter what the temperature is outside. 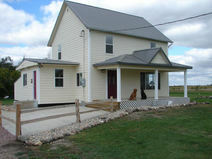 All at an affordable price and located just 4 hours west of the Twin Cities. No matter what you are hunting, we invite you to stay at DHL. Please call for reservations today! Rice Creek Hunting Preserve is located 5 miles East of Little Falls, MN and is known for it's superb, high quality pheasant hunting and its magnificent clubhouse! Tom Knapp says, "All hunts are as close as you can get to Wild Hunts and the pheasants are just as strong as any wild pheasants"! After your hunt, relax in Rice Creek's spacious lodge and have one of the finest meals from their new restaurant. When you can't keep your eyes open, just retire to your Jacuzzi Suite and do it all over again the next morning! Keep yourself AND your dog in good shape during the off hunting months with ducks and other waterfowl, pheasants, wild turkeys, and chuckar hunting! If your dog gets tired, you can fill your day with a round of trap, or sporting clays. Rice Creek has three levels of sporting clay target courses that will make an enjoyable day even for the beginner. It's very possible that if you visit the Rice Creek Hunting & Recreation facility during the late Summer and early Autumn, you'll find me on the duck pass or on the Sporting Clay Courses! If you do see me there, please step up and say hi and maybe we can shoot a round together! I hope to see you there! Hunting with Colorado Buck is an experience that youll remember for life! Trophy Deer, Elk, Wild Boar, Cat, or Coyote, Colorado Buck can put you on target, and thats all there is to it!!! 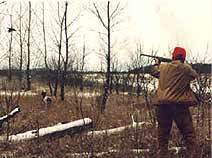 Buck Ward started hunting at a young age with his family. As a young man he was known as one of the best bear and mountain lion hunters in Colorado. He became a hunting guide and knew that to achieve his goals he must take it a step further. Sixteen years ago Buck became an Outfitter. Since that time he has hosted everyone from the common working man to noted celebrities. He is perhaps the best known outfitter for large trophy elk in the west. 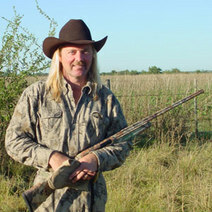 The Hunting Channel Online, www.Outfitters.tv and the Sportsman Channel. You will see Colorado Buck Rattling White Tail Bucks up to me on the "New" Benellis American Safari TV show which will air on The Outdoor Channel this coming July! Check my TV page for details after February. Contact Colorado Buck through his Web site below.